SeatGeek is your source for trusted Super Bowl Tickets. IF you like the infographic feel free to share it on your Blog, Tumblr, Twitter, etc. If you have questions about the data for a story feel free to email press@seatgeek.com. If entering on Twitter, you should also mention @SeatGeek in your tweet. Next to the chicken wings, peanuts, pretzels, popcorn and cold cans of brew in the fridge and friends and family over for the big game that is the Super Bowl, comes the annual tradition of seeing what brand/manufacturer/company shelled out big bucks (roughly $4 million this year for a :30 spot) for a Super Bowl commercial. Sure to have people talking at the water cooler on Monday morning (or Tuesday morning for those who partied a little too hard Sunday evening), the best and worst of the Super Bowl commercials each year has become good fodder for office debate. As a service to our loyal readers, we bring three commercials as a preview of what to expect this year. Sit back, relax and enjoy (or not). Everyone has their own opinion of the man that is Ray Lewis, given his stellar football career, checkered past and seemingly rebound to leading by example and becoming a role model for younger players across the NFL. Some consider him a role model. Some don’t. Most can agree that the stats he has put up in his career as the anchor of the defense for the Baltimore Ravens are Hall of Fame worthy – 13 Pro Bowl appearances, 2 time NFL Defensive Player of the Year, 2,000 plus tackles and the only defensive player to ever record over 40 sacks and 30 interceptions in their career. Coming back from what many thought was a career-ending injury earlier in the year, Lewis is on one final run, taking the headlines away from the game itself in some instances, as he looks towards retirement post Super Bowl Sunday. Will he abe able to add to the one Super Bowl ring he has, won back in 2000 when the Ravens beat the New York Giants? We’ll see come Sunday. What we do know is it will be the last time we see Ray Lewis suit up for a professional football game. Super Bowl Commentary: Who Exactly is Joe Flacco? You’ve read the credentials a couple of times in this Super Bowl blog – Joe Flacco has the most road playoff victories of any quarterback in NFL history, with 7. But who exactly is Joe Flacco, the quarterback for the Baltimore Ravens? Flacco was born and raised in New Jersey, where he played both high school football and basketball at Audubon High School. He started his college career at the University of Pittsburgh in 2003 before transferring to the University of Delaware after the 2004 season after just serving as a backup. He didn’t see his first full action until the 2006 season with the Fightin’ Blue Hens. He went on to set 20 school records as the starting quarterback. Drafted by the Ravens with the 18th pick in the first round of the 2008 NFL Draft, Flacco was one of only two QBs selected in the first round along with Matt Ryan of the Atlanta Falcons, who was the third overall pick. Now, Flacco faces off against the favored San Francisco 49ers and their dynamic upstart QB Colin Kaepernick. We’ll see if his steady hand can lead the Ravens to their first Super Bowl victory since the 2000 season. Super Bowl Commentary: Can Kaepernick Rise to the Occasion? One distinct advantage that the Baltimore Ravens have over the San Francisco 49ers is in the bucket of QB playoff experience. Joe Flacco boasts an impressive playoff track record, with the most road playoff victories of any quarterback in NFL history with 7. As for the 49ers, rookie quarterback Colin Kaepernick has had a meteoric rise to prominence after taking over the QB position mid-season after Alex Smith went down with a concussion. Leading the team to the Super Bowl with zero playoff experience is quite the feat, so it will be interesting to see if he can rise to the occasion on the NFL’s biggest stage – the Super Bowl. Kaepernick’s road to Super Bowl XLVII began when he forewent a career in Major League Baseball and was drafted by the 49ers with the 36th overall pick in the 2011 NFL Draft out of the University of Nevada. As mentioned above, he took over the position mid-season and posted a stat line of 10 touchdowns; 1,849 passing yards; 97.9 passing rating; 413 rushing yards and 5 rushing touchdowns. Add this to what he did against the Green Bay Packers in the playoffs, setting an NFL single-game record for most rushing yards by a quarterback with 181, you have quite an impressive start to a bright career in the NFL. On a lighter note, Kaepernick shares this success with his pet turtle Sammy, who is 115 pounds. The Super Bowl is this coming Sunday, so if you are still in the market for tickets, you can find the best deals right here at SeatGeek. Super Bowl Commentary: Or Is It The Bro Bowl? One of the coolest story lines of Super Bowl XLVII is the matchup between the head coaches of the San Francisco 49ers and the Baltimore Ravens. Why is it cool you might ask? It is a matchup between brothers Jim Harbaugh (San Francisco 49ers) and John Harbaugh (Baltimore Ravens). This is a first in NFL history as no brothers have ever faced off against each other in the Super Bowl as head coaches. A sibling rivalry with the Lombardi Trophy at stake, you can’t beat that. Several questions come to mind here. Who will mom and dad root for? Will they shake hands after the game, hug or will the winner give the loser a wedgie? What will summer BBQs be like with one winner and one loser? Is the less successful yet more dysfunctional brother coaching combo in the NFL – Rex & Rob Ryan – wondering what they are doing wrong? Just some food for thought. The Super Bowl is right around the corner, so if you have plans to head down to New Orleans, check out SeatGeek for the best deals on tickets. With the extended two week long analysis of Super Bowl XLVII having officially been kicked off, let us join all the major networks, internet sports sites, sports blogs and the like in providing a breakdown of the matchup you will see on February 3 at the Mercedes Benz Superdome in New Orleans between the San Francisco 49ers and Baltimore Ravens. The San Francisco 49ers come into the Super Bowl led by young upstart quarterback Colin Kaepernick, who has taken the reins of the offense and put up some big numbers in his first playoff experience. With Michael Crabtree leading the receiving core and Frank Gore pounding the ball on the ground, the 49ers’ offense will present some challenges for the defense of the Baltimore Ravens, which is riding the high of Ray Lewis’ final stretch in a uniform. We’ll see if the 49ers can get by the Ravens like they did the Atlanta Falcons in the NFC Championship. As for the Ravens, Joe Flacco is continuing his success in the playoffs, having now won the most road playoff games of any quarterback in NFL history with 7. But he is running into one of the best defenses in the NFL with the 49ers. We’ll see what he, along with his weapons Ray Rice, Torrey Smith and Anquan Boldin can do come February 3. It is sure to be a great matchup. As for tickets, check out the link below for the latest deals on Super Bowl XLVII tickets. If you have been wondering – (a) What are Super Bowl tickets going for? (b) How much do Super Bowl tickets cost? (c) how much are Super Bowl tickets – then you have come to the right place. SeatGeek has the most comprehensive set of Super Bowl ticket price data/economics and we have shared it with you below to make your Super Bowl buying decision a little easier. The packages below include a Super Bowl game ticket and a Pre-Game Super Bowl 2013 VIP Party pass hosted by Joe Theismann on the Joe Theismann on the Cajun Queen Riverboat. The average resale price for a ticket to Super Bowl XLVII is $3,301 — making this year’s game slightly more expensive than last year’s Super Bowl in Indy, but slightly less expensive than the previous year’s game in North Texas. The average resale price for a Super Bowl XLVI (Patriots vs. Giants) ticket was $2,990, while the average price for a Super Bowl XLV (Packers vs. Steelers) was $3,561. While Atlanta is closer to New Orleans in terms of driving/travel distance than any other team still in the playoffs, the secondary market for Falcons home playoff games this season has been tepid. The Seahawks-Falcons game last week was the least expensive ticket in the divisional round by a margin of $100, and average prices to the NFC title game this weekend in Atlanta are almost $100 less than the cost of tickets to the AFC title game in New England. This leads us to believe that Falcons fans wouldn’t drive up prices in the way that Ravens or 49er fans would. Below is a sample set of selling price data so you can get a feel for how tickets have been moving in the open market. Below we take a look at Super Bowl ticket prices through the years. More historical data to come in the weeks ahead. On February 3rd, an estimated 150,000 visitors will flock to New Orleans for the biggest game of the year. After watching ticket sales, game stats, travel prices, and more, SeatGeek has crunched the data to give you a look at the numbers behind the big game. An estimated 70,000 tickets were distributed: Where did they go? 29 x 1.2%: Split between other 29 teams. 500 Tickets: Raffled by NFL at face value. After SB XLVII, New Orleans will tie Miami for the record of most big games hosted. New Orleans (10), Miami (10), and greater Los Angeles (7) have hosted 27 of the 47 games. Cheapest Ticket Sold = $982 for an upper-level seat sold on January 21, 2013. Priciest Ticket Sold = $10,912 for a Loge Club seat sold on January 22, 2013. Secondary market tickets are selling at an average of $625 less than they were last year. This will be the 7th Super Bowl to be played at the Superdome. Still considering going to The Big Game? Join an unexpected record television audience watching the game on Sunday. 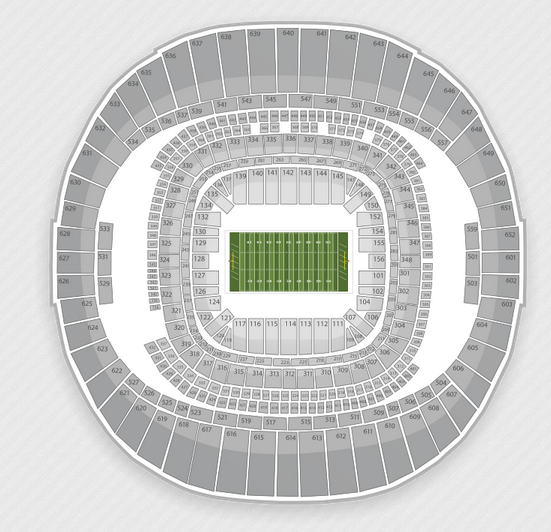 Head to seatgeek.com/superbowl to find the best deals on SB XLVII tickets. That’s crazy, I mean, no, it really doesn’t have anything to do with– </p> <p>Would you pay that? </p> <p>–the game or anything. To go to the game? </p> <p>Yeah. </p> <p>As a player, no, I wouldn’t pay that to go to the game. But I mean it is what it is. </p> <p>Pay that much for a Super Bowl ticket? </p> <p>It’s a big game. It’s the big show, you know. So people all over the world want to come to this game. So if they want to pay the money, you’re going to have a good time. </p> <p>$4,000, as a player when you hear that, is that crazy? </p> <p>I need some tickets [UNINTELLIGIBLE]. No, no, it’s not, man. This is a popular game. It’s a super, super, super popular game basically around the world, so no, it doesn’t surprise me at all. I think if they can expand this place twice the size they’d sell it out still, so you know it doesn’t surprise me at all. </p> <p>Would you pay $4,000 to go see the Super Bowl? </p> <p>I wouldn’t pay $4,000 for too many things so no, not me. </p> <p>Often like $4,000 for fans on average, is that crazy to you when you hear that number? </p> <p>It’s crazy. It really is crazy. </p> <p>Would you pay that? </p> <p>No, I wouldn’t. </p> <p>Super Bowl tickets are averaging $4,000 for fans. Would you pay $4,000 to see the Super Bowl? </p> <p>Hell yeah, you know what I mean, it’s the Patriots and the Giants, you know what I mean. And it’s two good teams, so you know you don’t know what you’re going to get. It’s going to be a great Super Bowl, man. And you even know it. You know what I’m saying? You don’t know who’s going to win the game. </p> <p>That’s true. </p> <p>You know what I mean? It’s going to be the best team that come out there and be physically and give it all they got. Nobody knows who’s going to win it. </p> <p>Super Bowl tickets are costing $4,000 on average. Would you pay $4,000 to see the Super Bowl? </p> <p>Nope. I wouldn’t. Chicago Bears, whom all seem to have a playoff spot locked up already. Super Bowl XLVII: We have seen Bears vs. Texans, Broncos vs. Falcons, Giants vs.
and Giants’ secondary, the Bears and 49ers speed, strength, and discipline. The 47th Super Bowl will be played in New Orleans at the famous Superdome. Details, capacity and seating chart information can be found below. Normally the Superdome holds 72,003 people so that is roughly what to expect for the Super Bowl. We are going to do some research and update on any seating capacity nuances related to the Super Bowl. The average ticket prices for Super Bowl XLVI ended up being $2900, due to a late decline. The drop in prices on gameday really had a profound impact on the overall price picture once the dust all settled. As we’d talked about all last week, we were seeing record average prices for SB tickets through Friday afternoon, with that average sitting somewhere near $3,300 — in line to be a record out of all events we’ve tracked in the last 3 years. But inclusive of Sunday’s sales, the overall average settled in at just a few cents north of $2,900. The absolute firesale in prices yesterday really caught us by surprise. I know we’d expected tickets to drop in that window before gametime, but not so dramatically. I read reports saying tickets were selling for face value outside of the stadium, which is almost unheard of for a Super Bowl. The average price we’ve seen tickets selling on gameday was $1,709. That price is just at 50%, or $1,705 less than the highest daily average which we saw during the week prior to the Super Bowl (on Wednesday, when prices averaged $3,414). As could be expected, prices all around the stadium plummeted yesterday. We saw tickets on our site on gameday for under $1,000–end zone tickets that were selling for $2,000 just a few days prior. And $1,700 on Gameday would have bought a club seat on the 30 yard line of the 200 level–a seat that was generally selling for $5,000 just days prior. $2,000 would have gotten easily gotten you a seat in the lower level on gameday. 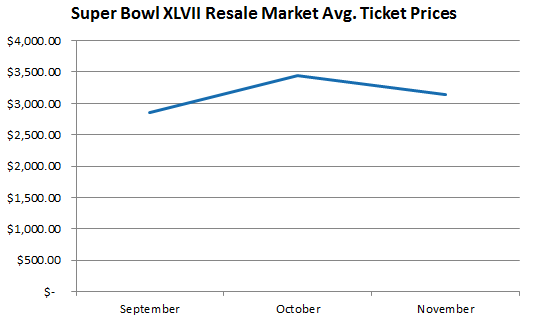 When you look at overall averages (the average of all tickets sold over the past 3 months), the drop in prices on gameday actually drove SB XLVI’s average price below that of last year’s game. Last year’s game averaged $3,067, and based on averages that include the gameday firesale, the average price for a SB XLVI ticket closed at $2,900. That overall average for SB XLVI was as recently as Friday in the $3,350 range – so the firesale dragged down the overall average $450. In sum, it’s hard to draw to any concrete reasons behind the dip, though the tight availability of affordable lodging in the local area likely prevented a lot of those “last minute” buyers from making the trip in on a lark and hope that they could secure a last minute ticket. Some people have also speculated that there was some relative apathy from Boston fans as their teams have played in a ton of championship games in recent years, and that those fans were less inclined to shell out big bucks to travel this time around. At SeatGeek, we’re huge fans of taking our rich, unique ticketing data and using it to unearth cool new insights about fan demand for sports, concert and event tickets. Considering the massive level of excitement around this Sunday’s Super Bowl XLVI matchup between the New England Patriots and New York Giants, we wanted to use or ticket data as part of a deeper look into how much a trip to Indianpolis will really cost for fans. So, we decided to do just that with this infographic (if you are looking for the quick answer, the average 2012 Super Bowl ticket price is $4607 right now). WF – Credit to Ryan Whitney for designing this infographic! These high prices are being boosted by strong demand among New York fans relative to Pats fans. Last year we looked at what a Super Bowl 35 ticket was worth in more detail. What Is A Super Bowl XLV Ticket Worth? Super Bowl Ticket prices are always insanely high but you’re thinking about paying up to get your hands on Super Bowl XLV tickets. One of the questions you might be asking yourself right now is, is it worth it? What is the opportunity cost (in terms of football games) of my decision? How many Pittsburgh Steelers tickets can I get for the price of a Super Bowl XLV ticket? How many Green Bay Packers tickets can I get for a Super Bowl XLV ticket? If you’re in this boat, you’ve come to the right place. EDITOR NOTE: The average prices below represent the average listing prices at the time of this post. In terms of price, it seems like the best deal would be to attend 24 Packers Home Games or 23 Steelers Home Games. If it were possible to attend 36 Packers @ Steelers games in your lifetime, then go for it, but that feat would be very unlikely. However, in order to rationalize to ourselves a $5000+ per person expenditure, we must deconstruct the Super Bowl in terms of utility per dollar, quite simply the bang for our buck as a dynamic experience versus a static price on a graph. If any of these highlights are important to you, the $5000+ is worth it, and you know it. If not, put your money into your children’s college funds; they’ll need it one day. But seriously, it’s the SUPER BOWL! One last interesting calculation that I’ll leave you with is the Avg Packers/Steelers Home Game Price Ratio = .959. 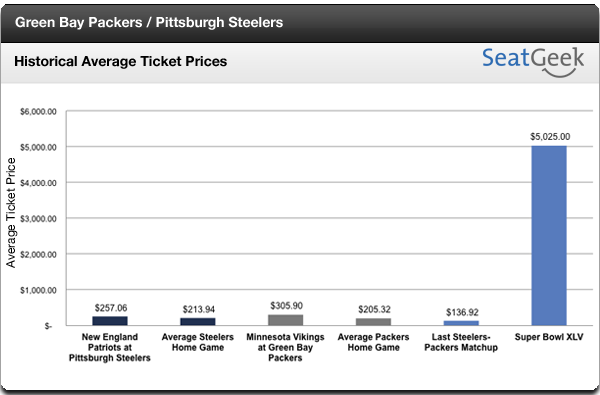 Despite the Super Bowl XLV spread in favor of the Packers -2.5, the Pittsburgh Steelers have a higher average home ticket price than the Green Bay Packers. How does winability affect average ticket price? Are there other more important factors? Leave a comment down below with your favorite super bowl stories (if you’ve been to a game) or your take on Super Bowl ticket prices.